With only seven Ironman races remaining before the first cutoff at the end of July, it’s a good time to have a close look at the current qualifying situation. This first post looks at the situation for the women, another post analyzes the men’s standings. Automatic Qualifiers: Kona winners of the last five years and the winners of the Regional Championships receive an automatic slot. Past Kona winners have to validate their slot with an Ironman finish. They do not count for the “points slots”. Safe: These athletes are more than 300 points above the projected cutoff and can be considered safe for a July slot. There are 14 female athletes in this category, but Liz Lyles has announced her retirement and is expected to decline her slot. 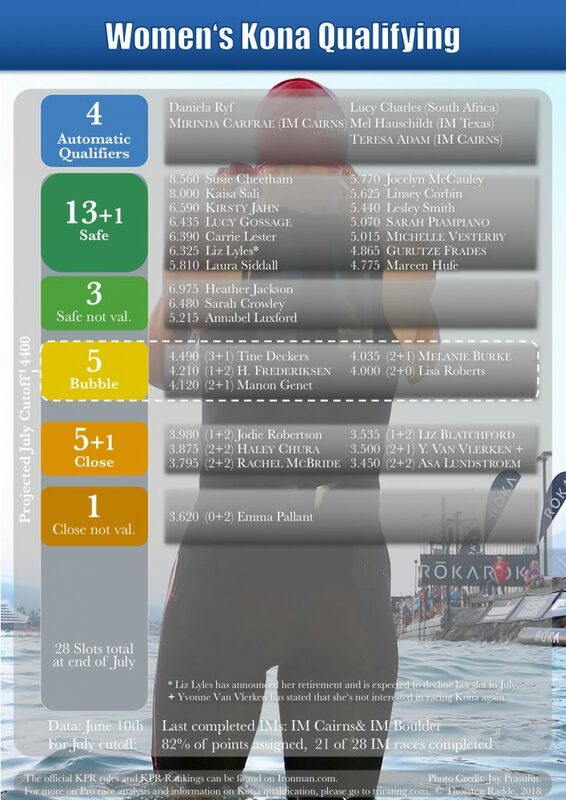 Safe not validated: These athletes have enough points (usually from a good Kona result the previous year) but still need an Ironman finish to be eligible for a slot. There are another three athletes in this category. Bubble: These athletes (currently five) are close the cutoff and might be fine for a slot – but there could still be a number of athletes that can overtake them and they can fall out of the slots. Close: These athletes will have to race again and improve their total in order to have a chance for a slot. One of these six athletes is Yvonne Van Vlerken who has said that she’s not interested in racing Kona again. Close, not validated: One more athlete in this category – at least an Ironman finish is needed, and Emma needs to add a good number of points as well. There is a total of 28 “points slots” for the women at the end of July. If you add up the number of athletes in the different categories (leaving aside the AQs) you end up with 29 (maybe minus two for Liz and Yvonne), so you can see that the race is very tight. 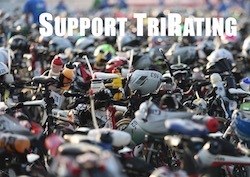 Ironman has released entry lists and start lists for all the remaining Ironman races up to the end of July. As always, they are easily accessible through my Race Posts showing the entries with their current KPR points and the seedings for races with a closed start list. As you can see, the number of athletes that aren’t on my graph but still have a chance to qualify is quite large. There are also a few more 70.3s on the calendar that may not have many points but can still make a difference when things are getting close, so it’s hard to tell at this point who will actually qualify. Some athletes (likely including Liz Blatchford or Asa Lundstroem) may also miss July qualifying but then look for another race in August to secure one of the seven female slots in August that are even harder to predict.